Don Tillman loves Rosie Jarmin, and they have been married for almost a year. 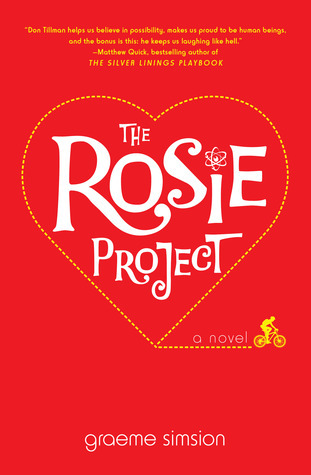 Their wonderful, unexpected, and hilarious romance unfolded in The Rosie Project, a book I reviewed here and a book I have recommended to many other people. Don Tillman is a genetist, and studies alcoholic mice. He also has Aspergers Syndrome, though he is completely oblivious to that fact. Rosy is study to be an MD, and is Don’s opposite in almost every way. While Don is organized and follows a strict schedule, Rosie is messy and spontanious. Don has trouble making small talk, and needs help with social skills. Rosie is carefree and handles social occasions with less stress and more fun. Yet, somehow together, they make it work. Don and Rosie are living in New York, and Don is working as a visiting professor with Columbia university. Life seems to be going on very well, until one day…Rosie tells Don that she is pregnant. While Don is shocked, Rosie is clearly off balance as well. She seems determined that she will just continue as she has been. She will work on her thesis, and work at her part-time job, and once the baby is born, maybe take a week off. Don, who freaks out more than a little bit over the news that his wife is in the family way, seems to come to terms with the situation more quickly than Rosie. The issue? Neither member of the couple seems to be able to communicate their thoughts clearly to the other over the whole baby issue. Don is terribly worried that he won’t be a good father. Rosie seems to feel that she’s somehow failed Don by getting pregnant, and since her father wasn’t present for her, she seems to expect Don to leave her. Don, being Don, tries very, very hard to help Rosie, help himself, and to keep the family together. Can he do it? It seems an impossible task. Hilarity, misunderstandings, and moments of true love combine to make a complicated, funny, and enjoyable tale. I particularly enjoyed the aftermath of Don’s attempt to learn about children by filming them “in a natural setting” on the playground. Wow, but Don even manages to resist arrest in the most amusing way possible. 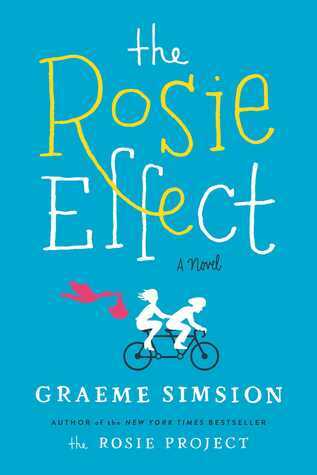 If you enjoyed The Rosie Project, then you will enjoy this book. Do you like Sheldon on “The Big Bang Theory?” I love Sheldon, with his arrogant sureness that he is always right, with his regimented way of doing things, and with his casual put downs of his friends and enemies alike. But you know, if you read that list of characteristics and didn’t know who I was talking about, you might wonder if I was crazy for liking Sheldon at all. He sounds like a regular killjoy. How can anyone enjoy such a person? And yet, with Sheldon, to know him is to love him. His antics bring me great joy. Don Tillman is like Sheldon, without physics and string theory and comic books. Instead, Don has genetics and cooking and a black belt in Aikido. Don also has Apserpers, but has no idea that he does. (The ironic humor of this strange gap in Don’s knowledge is a funny thread running throughout the book.) Don has had trouble finding a proper girlfriend. So many women start out to be promising, but then fail in one critical category. You see, Don has a list of requirements. The perfect girl will be punctual, logical, will not smoke, drink, or be a barmaid, among other things. Don develops a questionnaire, and he is going to find a proper girl to become his wife by screening those girls he dates. This looks like the perfect plan until Don meets Rosie Jarman. Rosie asks Don to help her locate her biological father by using his genetics knowledge. Rosie, who smokes, drinks, is a barmaid, and is never on time, is clearly not wife material, but Don is intrigued by her family quest. And soon, Don finds himself attracted to this unsuitable woman, thrown out of his comfort zone again and again and again by her unpredictable antics. Whatever is he to do? He is clearly stepping into the realm of madness, and can’t seem to stop, no matter how hard he tries.